OK. 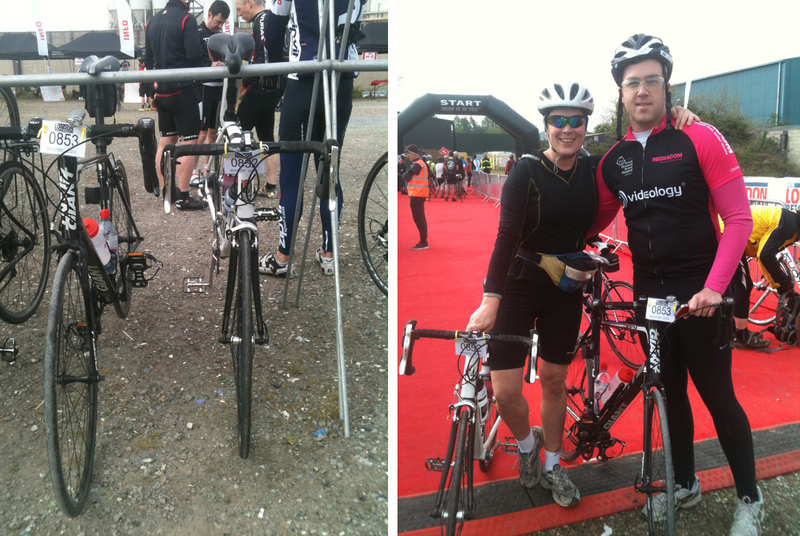 I had planned to get this blog done on Monday but the aftermath of completing a 180 mile bike ride (yes we did it!) was more than I’d anticipated. Apart from my achy bits and creeky knee which decided to give up 5 miles before the end of the MITIE London Revolution ride (it made for an interesting cycling technique), I’ve had a general feeling of complete disorientation. More like having been on the moon for 2 days rather than London’s home-counties. And dare I say it, a sense of sadness that it’s all over, even though I had wished that very thing on more than one occasion over the weekend! It’s funny coming out the other side. As I unpacked I realised that I had momentarily lost my mind in preparation for the ride. My extra supplies of food ‘just in case’ were ridiculous. So now we have cupboards full of peanuts, crisps, biscuits, chocolates and sweet drinks (my daughter Isla thinks all of her Christmases have come at once). And I had to find a home for my giant tub of Vaseline. Not to mention all the sweaty lycra to deal with – items that seem a bit alien now the ride is over. But it was definitely an incredible event to be part of and memorable in so many ways. 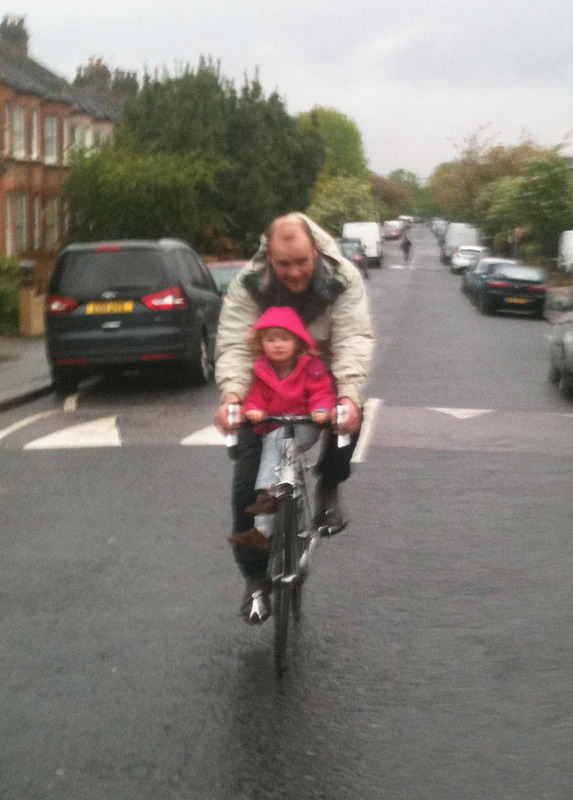 Peddling a beautiful Condor bike was a joy (and life-saver!). The feeling of camaraderie with other cyclists and the Revolution staff kept everyone going; camping at Windsor racecourse was surreal; I got to experience the beauty of London’s home-counties as I’ve never done before, and I got the pleasure of my brother’s company for 2 days. We made good cycling partners, although I spent more time than I’d ever imagined possible in my life staring at his backside! The sense of achievement is something to cherish too. The endless hills on day 2 didn’t break me (including Tandridge Hill for those who know this particular beasty) and I can proudly say I rode every one without pushing the bike. 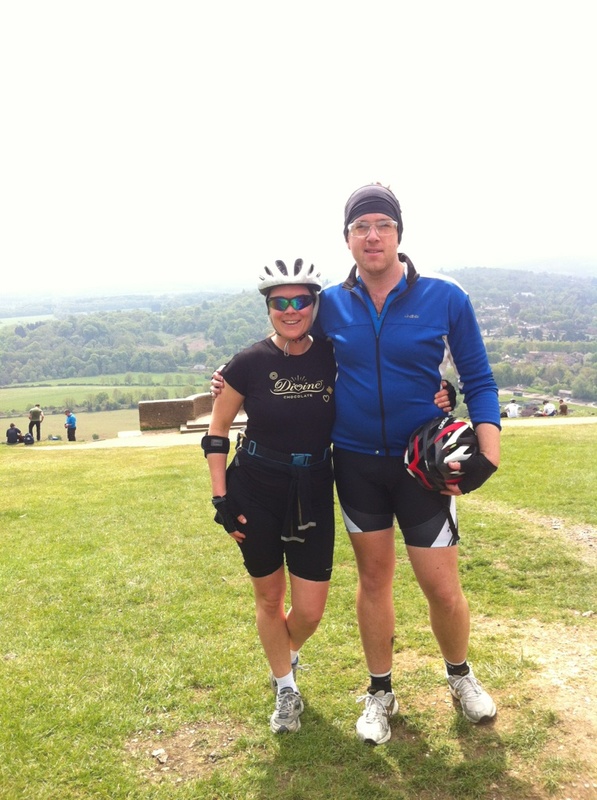 A small dream was realised when we made it to the top of Box Hill too. It was all unexpectedly … enjoyable. Would I do it again? Yes, absolutely. But not next week. Reaching the top of Box Hill! So a big thanks to Revolution Rides and Condor Cycles for making this possible, Divine Chocolate for fuelling the riders with delicious chocolate, and for all the encouragement of friends and family and unlikely sponsors for showing their support. 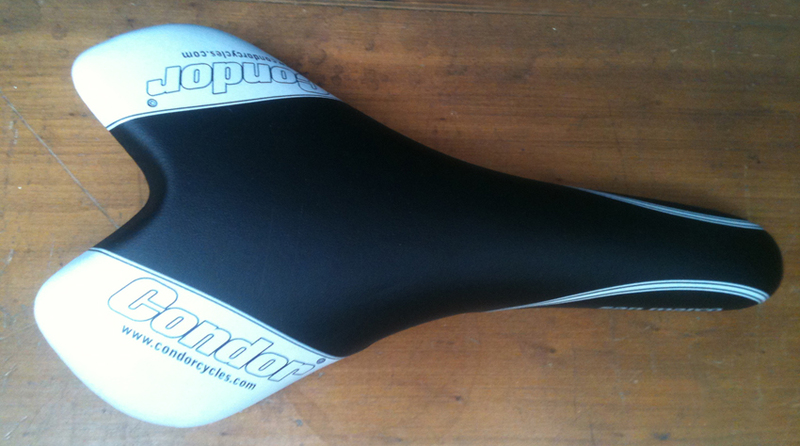 I couldn’t end this blog without sharing a little confession to Condor Cycles . Despite my best efforts, that racing saddle never did come on the ride with me. A few necessary modifications were made in that department and my faithful saddle for many a commute came instead. As they say, you can take the commuter out for a cycle, but you can’t take the commuter out of the cyclist. Or something like that. 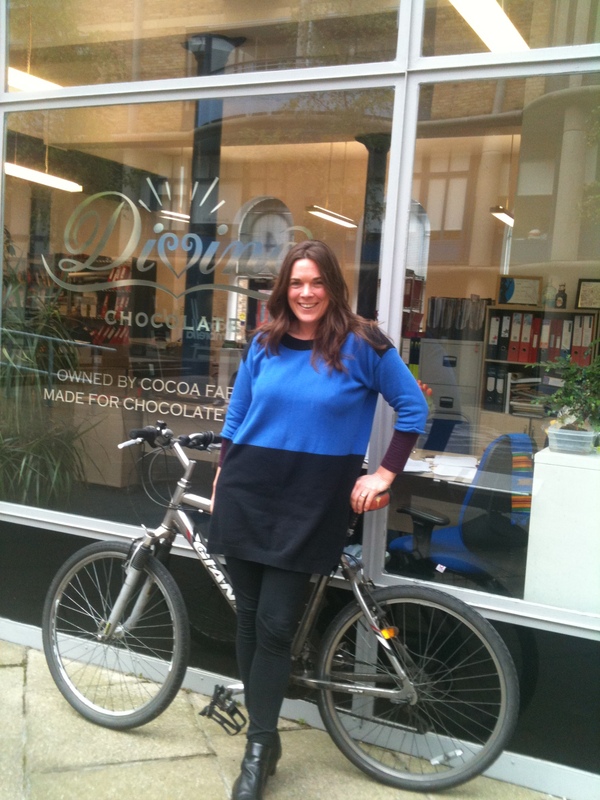 Here’s Sara’s last post before she cycles off into the distance! Crikey – my last post before the MITIE London Revolution ride after a couple of days of getting to know my new Condor Italia. I hadn’t anticipated a summer romance this year (well any year actually) but I think I’m falling in love with this Italian. Aside from the fact that it looks incredible, it’s unbelievably light (I can literally lift it up with one finger) and has the most amazing gears which change without the merest suggestion of effort. I’m suddenly filled with confidence about Box Hill and some of the other slightly alarming looking hills on the Day 2 profile. In fact I glide up Croombs Hills with such ease now, it’s not so much the prospect of the circuit that’s making my eyes water any more, but the prospect of completing it on a wafer thin racing saddle! I’m definitely a commuter in this department. Sorry Claire (I have tried) and thank you Sonja for the nice padded gel cover. Other than upping my laps of GreenwichPark, my training schedule has involved upping my calorie intake. This has been an unexpected fringe benefit of riding 180 miles in 2 days. 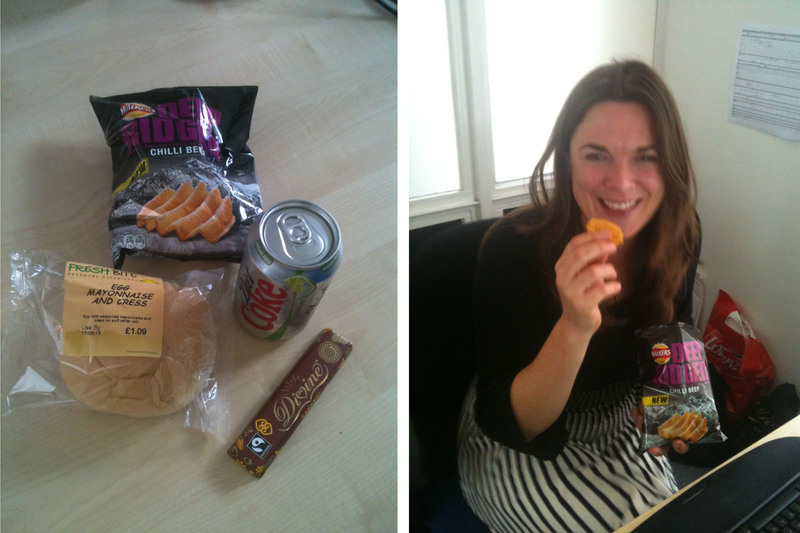 My ‘lunch of shame’ was snapped by my incredulous boss (it was my second lunch of the day) and my chocolate covered Brazil nut and new Divine Caramel bar consumption has gone through the roof! I’m going to miss my guilt-free munchies next week. I couldn’t start the ride without thanking everyone for their generous sponsorship and introducing you to ‘Team Divine’ who will be doing the 2 day circuit with me. The pit crew, Tony and Isla, will be following us around the circuit with back-up supplies, chocolate samples and my old saddle just in case! And my brother Cameron will be riding with me. He was the only person I knew other than my husband who would be up for registering for a 2 day cycling event just as the training schedule had ended. So what’s left for today? I’ve made my ‘to do’ and packing lists – a surprising amount to do and bring before a crack of dawn start tomorrow. 1. Collection of my repair kit from the Post Office. 2. 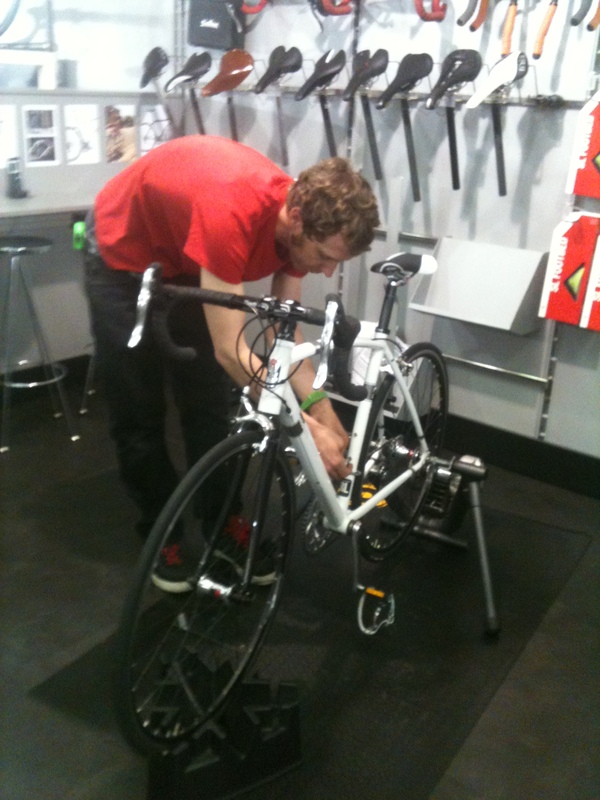 A crash course in changing an inner-tube from Team Divine’s chief engineer (Tony). 3. 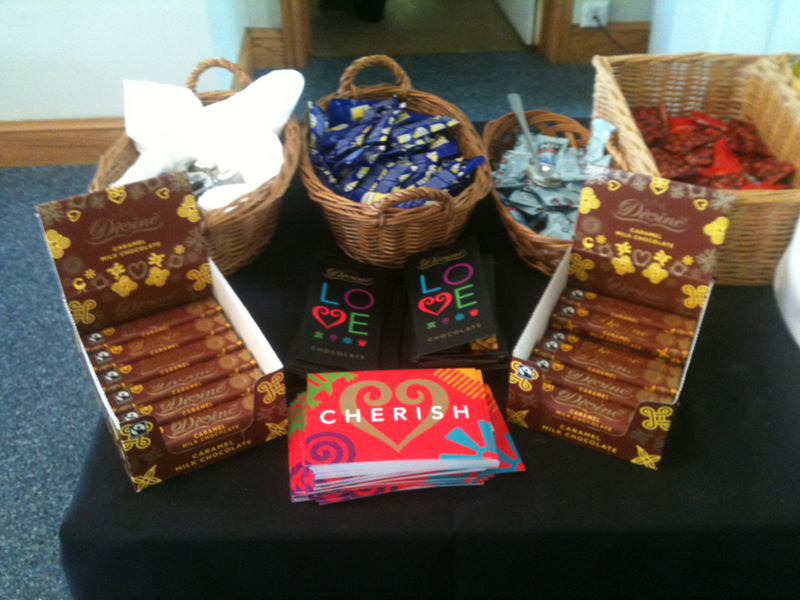 One last trip to the Divineoffice to pick up some chocolate samples and Usherette tray for all the deserved cyclists at the Windsor Racecourse on Saturday night (look out for the woman in the Divine t-shirt walking like John Wayne). 1. A giant tub of Vaseline! Et Viola. I’ll be all set. See you on the other side! I’m fundraising for a Kuapa Kids Camp, being held from 11th-13th July 2013 in Kumasi, Ghana. The Kuapa Kids Camps are residential camps for young people from rural cocoa growing areas organised by Trading Visions in collaboration with Kuapa Kokoo. Trading Visions is an educational charity set up by Divine to amplify the voice of cocoa farmers in West Africa, and particularly to link young people in Ghana with their contemporaries here to learn more about issues at either end of the supply chain. The Kids Camps are brilliant for boosting the confidence and educational attainment of the students. 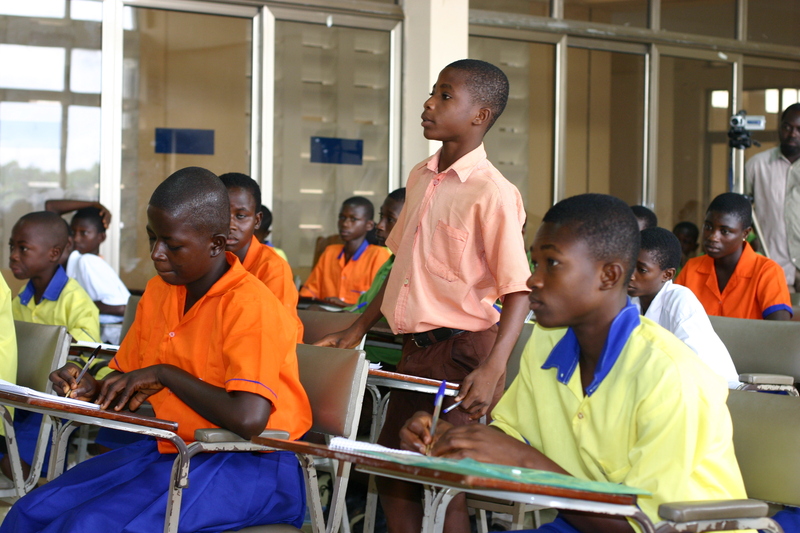 They also help to energise their schools by increasing the active participation of teachers, parents and the local community in the schools. 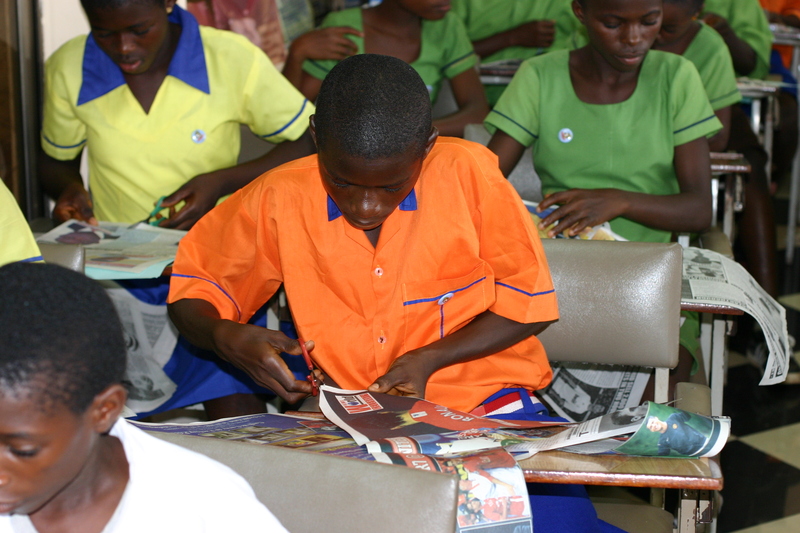 We also use the Kids Camps to work with the children in Ghana to help create educational materials on Fairtrade chocolate for young people in the UK. At the next Kuapa Kids Camp, around 70 children from rural cocoa growing families will be coming together for three days, many of them leaving their villages and mixing with children from other schools for the first time. They learn about Fairtrade and their role in the global chocolate supply chain, and issues such as nutrition, child labour, health, and girls’ education. The Kids Camp cost will be £7,000. The Hull Fairtrade City Project has pledged £2,000 to help fund it, plus another £1,500 of match funding for any money we raise. Please help by donating to this important education project for children living in rural farming villages in Ghana. Click here for my fundraising page. 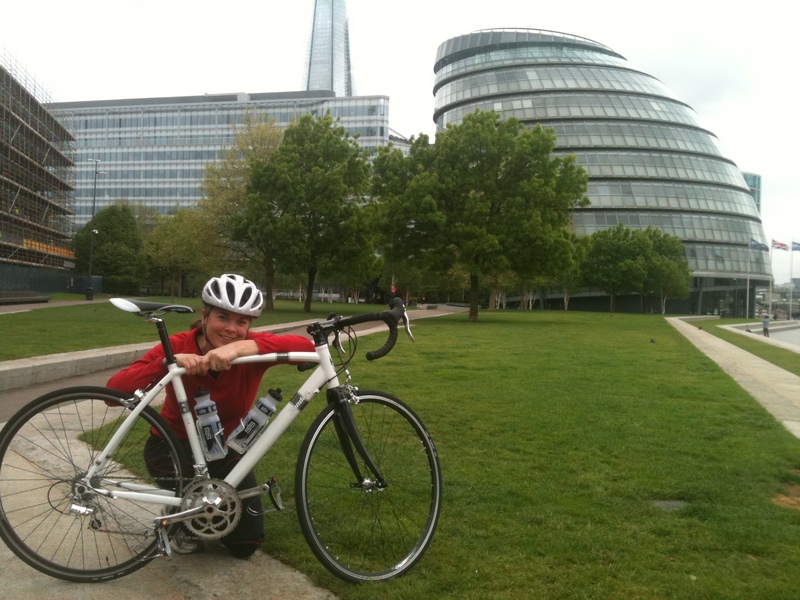 Dubble‘s Sara Barron with her second post as she prepares to cycle 180 miles this weekend with Mitie Revolution and goes to Condor Bikes to pick up the bike they are lending her for the event…. I wasn’t quite sure what to expect at the Condor shop this morning. I’ve never been ‘fitted’ for a bike before. It was actually quite physical. More like being at the osteopath’s than a bike shop. Once I’d stretched and rolled my head around, James had the task of talking me through various adjustments, gears and body positioning. We established that I had wonky shoulders and longer than average legs (I never heard that before!) although I wasn’t sure if the size of the seat was an indication of being larger than average in other areas. Once fitted, Claire checked my tyre pressure and attached my bottle cages. I was intrigued to hear about the history of Condor as she worked on the bike. They design all of their bikes in London as they have done for the past 60 years, and they continue to produce all of their frames by hand in Italy. It struck me and how akin the values of Condor and Divine Chocolate actually are – basically, no compromise on quality or ethics in favour of cheaper products. Claire took me through the last few items on my checklist. We talked about the merits of various performance gels (baffling) and soon established I wouldn’t need any given the banana fuelled pit-stops along the MITIE Revolution circuit. She gave me a supply of inner tubes and a multi-tool and with some good luck well wishes I was sent on my way. With the bike! Despite the fact that I REALLY hate cycling in the City I managed to navigate my way safely from Gray’s Inn Road, along Chancery Lane and Cheapside and over London Bridge back to the office. I have to say that I’m over the moon with the Condor Italia in my possession. Claire couldn’t have picked me a better partner and I’m itching to get to know it better on a more familiar and quieter ride along the Thames when I head home this evening. Sara Barron (Dubble HQ Online and Product Manager here at Divine) is getting ready to complete the Revolution ride this weekend – here’s her first post…. 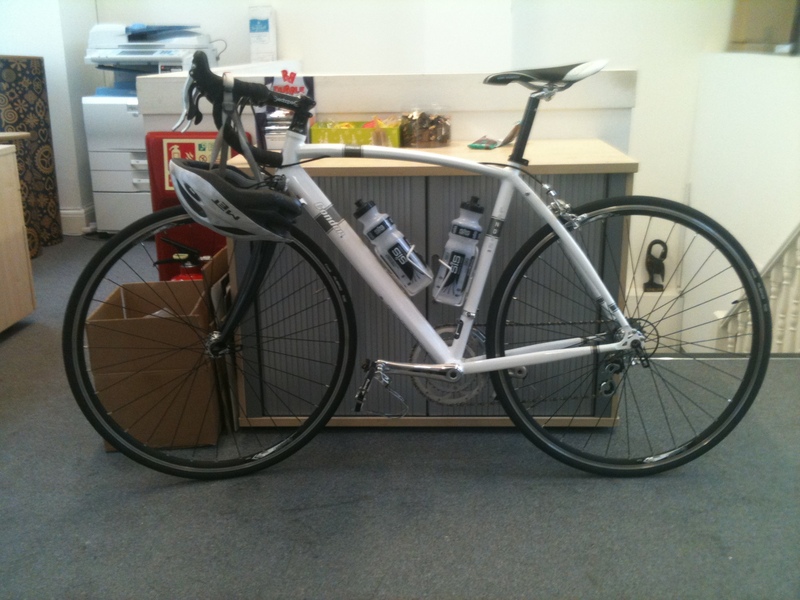 Sara Barron before the upgrade (the bike I mean)! When Tal told me about Divine’s sponsorship of the Mitie London Revolution cycle ride this year my ears pricked up. But when she asked me if I wanted to do it as one of Divine’s ‘keen cyclists’ my initial thought was ‘Am I?’. Yes, I cycle to work every day come rain or shine and yes I love it but I’ve always thought of myself as a commuter rather than a cyclist. I actually avoid roads and other cyclists as much as possible on my commute along the Thames Path from Greenwich to Tower Bridge. I don’t own lycra shorts or any other cycling gear, apart from a helmet and some toe clips (which my husband bought me for Mother’s Day). And my bike is only still roadworthy due to the constant vigilance of my husband who frequently disappears into his shed with it and emerges with something that doesn’t squeak and feels 10 times more comfortable to ride. But even he declared it ‘unfit for purpose’ when I floated the idea of a 180 mile bike ride past him. Tal brushed these reservations aside and told me to go ahead with my training programme, get the necessary gear and she would sort out a bike. Low and behold a collection of parcels of new equipment – including lycra shorts – are piling up at home, and today our lovely friends at Condor Cycles told us they have a bike ready for collection which they are generously loaning me for the summer. Incredible! Lizzie at Mitie London Revolution took care of my last minute registration, and so here I am on Monday afternoon with the prospect of a 180 mile bike ride ahead of me at the weekend. That too is incredible! I have a knot in my stomach. I can barely contain my excitement at the prospect of completing this iconic circuit on an iconic bike. But so far the extent of my hill climb training for Box Hill (which despite my commuter mentality I’ve always had a secret passion to cycle) has involved a few circuits of Greenwich Park and Croombes Hill en route to work. A sense of competitive determination to finish the course in a decent time and enjoy the ride is bubbling up. I’m just hoping my old bike is the only thing that’s ‘unfit for purpose’.